My scheduled announcement about this two day weekend climb read, "This is not the climb to get in shape, but to get in shape for." That phrase was borrowed from another trip earlier to do the same two peaks, Merced Peak and Red Peak. Not all of us got Red, and one backpacker elected to stay around camp instead of bagging any peak. This was the last 25 mile plus day I had in the High Sierra, inspiration courtesy of the previous trip leader. This inspired a nurse to work double-shift (16 hours) on her job, and brought to achievement my ultimate distance goal on wilderness peaks and trails, well off the scale of the local chapter rating system. We met in Yosemite Valley Saturday morning. I had taken pictures of the "Wall of the Early Morning Light," which is the east face of El Capitan. The weather was beautiful. Waiting in line at the old backcountry station, we got our wilderness permit. They didn't open till 7 or 8 a.m., so we had the time for a nice, early breakfast at Yosemite Lodge. Driving up the Glacier Point Road to Mono Meadow Trailhead, we prepared our packs, then the five of us were off. Descending down to Illouette Creek, we crossed the stream and hiked along on the trail toward Ottoway Lakes, some 14 or 15 miles from our start. Park trails are generally pretty good for fast foot travel. Passing Mt. Starr King, which is a big double dome as well as a good class 4 climb, we continued heading south, and saw a bear yearling enroute. The scenery otherwise is simply endless lodgepole forests. Just before the Lakes, we found and used a small, off-trail, lake for our base camp. There was a big, 15 foot high rock that could only be ascended by class 5 climbing. We deemed it safe from bears, so stored our food and garbage atop it. One of the participants was good enough to make the ten foot high moves. He had to physically jump off, since downclimbing wasn't practical. I remember having a cheap, freeze-dried, spaghetti meal, or some such dinner, and getting to sleep early for our "impossibly" long day tomorrow. The air was still and the birds chirped peacefully. Waking up early, which was quite refreshing with the cool of the forest, we began our climb at about daybreak. We hiked the quarter mile back to the main trail, then along it east to about Upper Ottoway Lake. Heading cross country for Merced Peak, we climbed with the famous glacier to our right and below us. John Muir was said to have formulated his theory on the Valley being created by glaciation, from his study of this particular glacier. We soon reached the top of the peak, and enjoyed the warm temperatures and the clear skies. But, our climbing wasn't over yet! I decided that we would run the ridge over to Red Peak, even though, seen in hindsight, dropping down to the granite bench to the west would have been better. As a logical peak climber, I deemed that not losing elevation would save work. The ridge was rocky and tedious to hike over. We came to Ottoway Peak, which is a nondescript bump along the way over to Red Peak. There may have been a register. Some of the climbers may have had concerns about getting back home. We were losing time on this bouldery route. Two hikers went ahead. There was a corner to round, then, as I caught sight of Red Peak, I realized my error. Also, right about then, one of the hikers had injured himself. We made it to Red Peak Pass. I didn't think that it was that serious, by the casual attitude of the hiker. He gave himself first-aid, then declared that he would leave the climb and hike out. The hiker he was with said he wanted the third peak. I signed him off, and then returned to base camp with the group. Thankfully, our nurse-hiker obeyed my directives to stay at camp, and didn't go off hiking and get lost. As we prepared to backpack out to the cars, the other climber arrived, claiming success on Red Peak. This was a real animal. We were all tired from an already merciless climbing plan. I led a fast pace, since by my calculations, we had to hurry to reach the vehicles by dusk. Some were, perhaps, incredulous by what we were doing. With a chance to soak my feet, the nurse had a rough time hiking up from Illouette Creek to the trailhead, which is about a thousand feet gain. But, we all arrived at the cars, then were on our way home. We had a late dinner at a restaurant along Highway 99, and came home at about 2 a.m. in the morning. At the restaurant, the injured hiker showed me his wound. I was astounded! It was a deep cut, which he said a sharp rock had made. He had used a butterfly bandage to close it. I think bone was showing. On reaching home, he went straight to the infirmary where he worked, and they stitched it up. I filed an accident report with the Club, and he was to never attend a trip again. The cut left a scar which he showed to me years later. This was the only moderately serious injury on any of my scheduled leads. I thought then that he should have been helicoptered out, to avoid aggravation to the wound, but he had chosen to hike out. In years later, the local chapter would have helicopter search and rescues of climbers who hadn't even been physically hurt, but that was them. We all received kudos and certificates just the same. I never went back to climb Red Peak. It is one of the few SPS-listed Yosemite peaks that I have never climbed. But, the goal of SPS List Completion has never entered my mind. 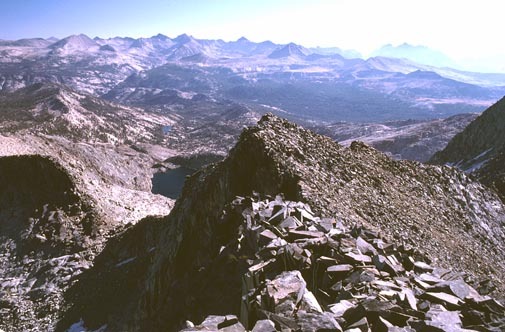 To climb every one of 247 listed Sierra peaks takes speed, finesse, financing, and extreme determination. Some climbers frown on this, content with claims of doing sufficiently difficult, technical climbs to claim supremacy in matters of mountaineering. Well, they may be champs on the rock in the backyard, but they'll never be where we have all been. That, perhaps, is the difference between many local rock climbers and peak climbers!